Total Tippins Takeover: Happy Groundhog Day!!! I bet you would never have guessed that Groundhog Day (February 2nd) is one of my all time favorite holidays! Wanna know why I loooooove it so much?! After drying my tears and collecting myself, Jeffrey took me out to a nice dinner in Breckenridge to celebrate the job offer (and an early Valentine's Day). We went to this great steakhouse and I cleaned my plate, while he just watched - ha! I remember asking him if he was sick, because he wasn't eating much and he was acting strange. He told me he thought he might have had a little altitude sickness. After we ate he offered to BROWSE around town with me. Poor guy even let me try on hats, and sweaters, and boots, and anything else my heart desired while he just patiently watched and waited. We got hot chocolate (which I spilt all down the front of my white coat) and then went to go see the ice sculptures in the snow village. It was snowing pretty hard at this point, so we decided to head back to the car. On the way back to the car, he stopped me by the last ice sculpture and got down on one knee and asked me to be his wife. Don't ask me how I could be so surprised when we had dated for sooooo many years, but I was! I cried and cried, took off my gloves so he could put the ring on my finger, and then we stopped some poor boy carrying a pizza and asked him to take our picture...the night could not have been more perfect. God's timing is always perfect, isn't it?! We called all of our friends and family and first thing the next morning, I called my principal back and accepted the job! Another perfect "Groundhog Day" moment that I will never, ever forget. 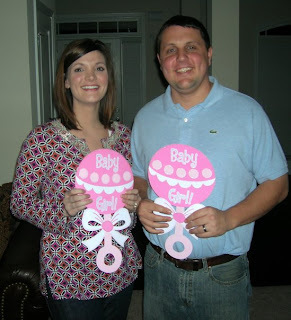 We found out that our sweet baby was a girl! I was so sure that I was having a boy. 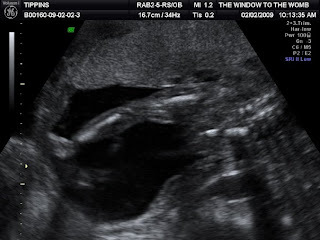 At first, I kept telling everyone (including myself) that I thought I was having a boy just so I wouldn't be a little disappointed when I found out that I really was. But, then I really and truly started to believe that I was having a boy! I had picked out boy bedding and we had a boy name ready to monogram on everything blue. I was just convinced I was having a boy. 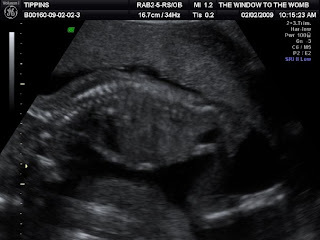 The day of the big appointment, poor Jeffrey was looking for a certain body part the entire time and if you've ever seen an ultrasound, you know that there are LOTS of things in an ultrasound that can look like that certain body part - ha! When the doctor told us we were having a girl, I didn't believe her. She assured me that she never saw those parts on boys....just girls. I think I may have even asked her if "it" could have just been hiding or tucked away. Again, she assured me that we were having an anatomically correct GIRL!!! I laughed and then I cried. (I did make her check two more times at my next appt's to make sure that she was STILL a girl....and part of me was not 100% convinced until I actually saw HER with my own eyes!) We had NO idea on Groundhog Day 2009 how that sweet baby girl growing in my belly would forever change our lives. What could be better than spending the day with this Sweet Girl? !